Jose's Art Journal: New notebook. yay! 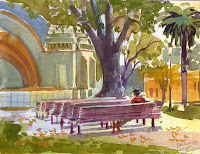 Two sketches from an unusual spot in Pasadena. Memorial park I think it's called. The Park has a definite East Coast penchant but what attracted me there initially were the blooming trees. They are spectacular. You can see a small one in one of these watercolors. This is one of those rare occasions where I miss the masking fluid. It would work so well with the bloomig trees and little specks of light in the counter-light. Después de lustros sin estar en contacto... I found you en la red!